The 2018 Second Edition is now FREE online as a searchable PDF file! PLUS, new paperback copies are being printed, on hemp paper with soy ink, pre-order today! It’s Easy Being Green © 2003 was originally written and compiled for this charity by Jennifer Pratt and edited by Lisa Craig Gautier, founder of MatterofTrust.org. Now, thanks to Janet Jose and Joyce Joseph, we have added the latest facts and websites, a hyperlinked index, and updates on relevant Joyce’s Choices in the back. The new paperback version has over 180 pages and we are again using A. Maciel Family Printing who pioneered soy-based inks in 1984. Also like in 2003, we reunited with the Greg Barber Company for their socially responsible paper stock. 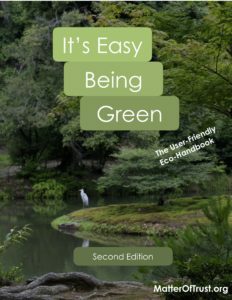 This long-lasting delightful guide to a convenient, green lifestyle offers hundreds of useful tips. See how small choices by individuals add up to big change and provide ways to get more pleasure out of life. A great gift and must-have for every wifi-less bathroom reading stack! Available for purchase on our online store here!